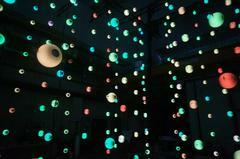 The science inspired light and sound installation [aiskju:b] has celebrated its premiere in Berlin. The “Astroparticle Immersive Synthesizer³ – AIS³ [aiskju:b]” created by the concept artist Tim Otto Roth picks up structure and function of the neutrino telescope IceCube in the perpetual ice of Antarctica that spies for high-energy cosmic particles called neutrinos. DESY, the largest European partner involved in IceCube, supported Tim Otto Roth to bring his ambitious project [aiskju:b] into being right from the start. The installation is open to the public free of charge from 29 August to 16 September every day between 3 p.m. and 9 p.m. (Saturdays and Sundays 12 to 9 p.m.) at the Cultural Church of St. Elisabeth. 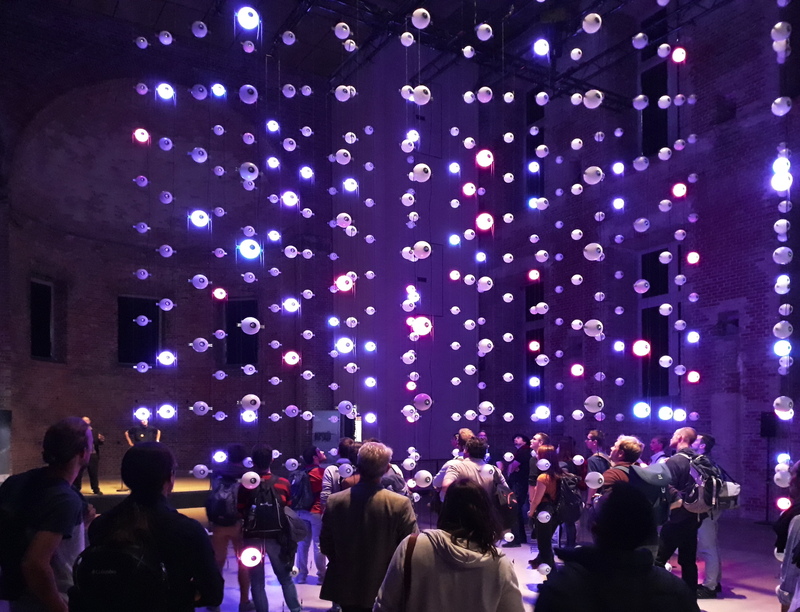 Roth’s light-and-sound installation taps on real IceCube data and allows visitors to immerse themselves in the events taking place at the South Pole, experiencing neutrino collisions virtually in real time. “This project allows an audience that does not have such close connections with science to experience the fascination of science. The unconventional approach to a current research topic therefore offers a sensory experience that augments our classical communication about our research,” explains Christian Spiering, former head of the IceCube Group at DESY and the founder of the Global Neutrino Network. Even though billions of neutrinos shoot through us every second, they are extremely difficult to detect because these light elementary particles hardly ever interact. In order to capture a few of the extremely rare interactions, the scientists at IceCube have frozen 5160 light sensors into the ice in long strings, distributed throughout one cubic kilometre of the Antarctic ice shield. The sensors register the tiny flashes of light that are created during the neutrinos’ rare reactions. These can be used to determine the direction in which the neutrinos were travelling and their energy. 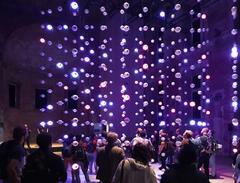 The [aiskju:b] installation consists of 444 spherical loudspeakers suspended along thin wires in the interior of the Cultural Church of St. Elisabeth. They are fed signals in two different cycles: during one cycle, the low-energy detector noise of IceCube is translated into low-frequency sinusoidal signals, weaving an undulating, almost psychedelic carpet of sound. During the other cycle, trails of light race through you: for this, Tim Otto Roth uses band-pass filtered noise, turning the measured movement of particles into a physical experience. 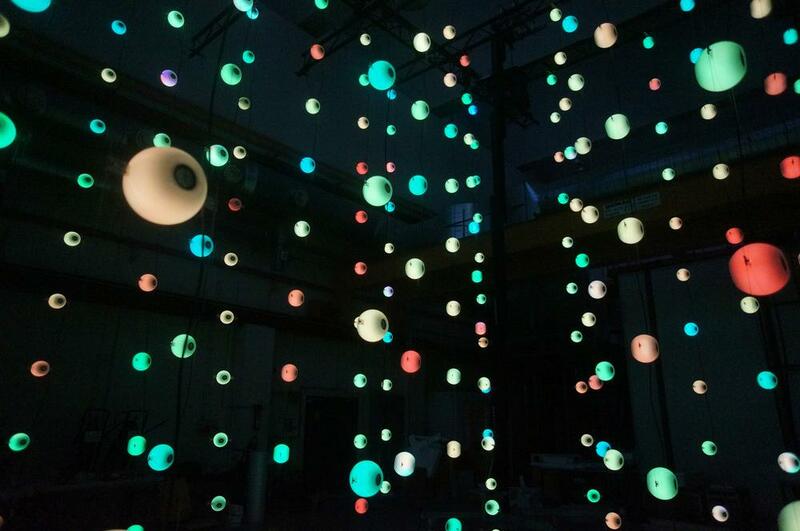 Sometimes they can be heard as a cascade passing right across the sound space, sometimes as a spherical eruption of sound-and-light structures. Visitors are free to move among the loudspeakers, which are suspended from 37 wires, and so to follow the movement of the ghost particles across the room. Cushions also invite them to linger and contemplate. The loudspeakers of [aiskju:b] are shaped and arranged like the sensors in the Antarctic ice. Each of the 37 wires supports 12 spherical loudspeakers, creating a freely accessible space of sound and light measuring around eight by eight by seven metres. Fed the latest data from the IceCube experiment, the measured energies are translated into coloured light and sounds which blend to create different tones, depending on one’s position within the room. The aim is not only to offer laypeople and scientists a new way of accessing physical research, but also a new, interdisciplinary practice of art: AIS³ is a work of art and at the same time an experiment in fundamental psychoacoustic research; it allows the space itself to become a sound generator into which visitors can immerse themselves. To accompany the opening of [aiskju:b] in Berlin, DESY has organised a comprehensive supporting programme which includes an exhibition on the research at the South Pole, evening lectures, guided tours for schools and a further training course for teachers. The symposium Physics and Art(efacts) has been introduced as a new format: in [aiskju:b], physics and art enter into a special liaison, which has until now had little scientific light shed on it. This is why the astrophysicists Christian Spiering and the historian of art and science Tim Otto Roth are taking the presentation of [aiskju:b] as an opportunity to ask proven experts – not only from the field of physics and art but also historians of art and science as well as musicologists and media scientist – about the significance of the physical in art and the natural sciences, in an interdisciplinary symposium being held on 14 and 15 September. The natural sciences will be represented by the DESY scientists Thomas Naumann and Robin Santra, among others, as well as Rolf-Dieter Heuer, the Vice President of the German Physical Society and former Director-General of the European particle research facility CERN outside Geneva. “IceCube is the world’s craziest telescope!”, explains Spiering. Instead of detecting light, X-rays or radio waves, it observes neutrinos, tiny, electrically neutral elementary particles that interact extremely rarely with matter. Out of the 60 or so billion neutrinos arriving from the sun alone within a single square centimetre of the Earth every second, only about a dozen interact with an atomic nucleus as they pass through our planet. These “ghost particles” nevertheless carry some unique information about the cosmos. Being so reluctant to react with other particles, they are able to escape from even the densest cosmic objects virtually unimpeded, which light itself is only able to leave indirectly. In 2013, IceCube succeeded in detecting high-energy cosmic neutrinos for the first time. 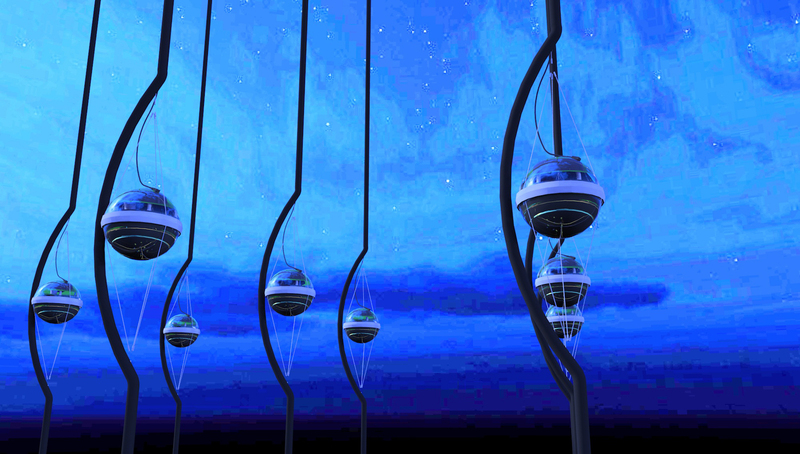 Initially, the directions from which these neutrinos were arriving appeared to be uniformly distributed across the skies; no concrete source could be identified. However, this changed in July, when IceCube made the headlines with a scientific triumph, after an international team of scientists managed for the first time to identify the vicinity of a super-massive black hole in the Orion constellation as the source of cosmic neutrinos – a breakthrough for the budding field of neutrino astronomy. DESY’s scientists were instrumental in this success, which marks the first step towards mapping the neutrino skies. “Aside from gravity waves, for whose discovery the Nobel Prize was awarded in 2017, high-energy neutrinos will in future serve as important new carriers of astrophysical information,” emphasises Spiering. The exhibition and the supporting programme are being funded and supported by: Hauptstadt Kulturfonds, Schering Stiftung, DESY, APPEC, RWTH Aachen/F. Victor Rolff-Stiftung, TU München/SFB 1258, Hamamatsu, Joachim Herz Stiftung, Kultur Büro Elisabeth.